If phones were cars, the screen would be the dashboard, the CPU would be the engine, the battery would be the gas tank. And the apps? The apps would be the wheels. Without apps, you’re going nowhere. With them, the world’s your oyster. That’s why the global app market is already worth $27 billion – a massive figure that’s set to grow by 30% within the year. That’s why the world’s most popular app, Facebook Messenger, has over 700 million users. And that’s why each and every one of us has about 22 apps on our phones (in fact, if you’re an Apple muncher, that’s likely to be more like 37). You’ll know Apple’s App Store and Google’s Play Store, but our own favourite is Amazon’s Appstore for Android – a modest player comparatively, but one with massive potential and some genuinely innovative advantages over its behemoth rivals. From its Test Drive feature (where, thanks to Amazon’s cloud computing grunt, you can try an app out on your PC before you buy it on your phone) to that 1-click checkout with 14 years’ worth of ready-to-roll customers. Plus, of course, the thing that made it famous: the game-changing free app of the day, where users get to download a new premium paid app for no cost every 24 hours. Amazon, in our view, are in a much better position to capitalise on Social Commerce, too – and, though they’ve a way to go, they’re already ahead of the game compared to Apple & Google. You know the “customers who bought this also bought” recommendations you’ve been using to inform your physical Amazon purchases for the past decade? That’s there, and it’s infinitely more useful than Google’s taxonomically-surfaced “Similar” recommendations. And Amazon’s five-star rating system just works – no wonder users appear to be five times more likely to leave a rating than they are at Apple’s store. Things like these build consumer trust, so it’s little wonder that Amazon’s store monetises almost four times more effectively then Google’s and that Game Circle, Amazon’s recently-introduced social gaming layer, drives a further[80% growth in revenue per user. Make no mistake: when people want free Android apps they go Google. When they want to spend, they go Amazon. So, an incredibly promising start for a relative newcomer with only two years trading under its belt and the world’s third biggest company as its main competitor. 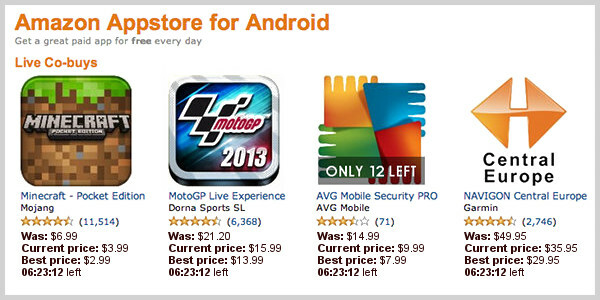 But there’s still much, much more Amazon could be doing to become the de-facto choice for Android app purchases. Right now, their absolute number-one, top-top priority should be turning its massive core user-base into an unbeatable marketing machine. Get that done and watch the market-share soar. To explain why this would make such a difference, we need to think about the biggest problem with app stores (not just Amazon’s, all of them): discovery. All the app stores try the same gambits: broad categories for browsing, personalisation for suggestions, charts to see what other people are downloading and buying. But this is how you merchandise media, not apps. Buying a game or a mobile document viewer isn’t like buying an album. Just because I bought one English-German dictionary, that doesn’t mean I’m remotely in the market for anything similar (I’ve already got what I need, thanks). The long and short of it: browsing for an app you’d actually want to buy is often like looking for a piece of hay in a pile of needles. Impossible and painful. Searching for an app to buy doesn’t fare much better. An incredibly crowded market (with famously low points of entry) means that, for every great app, there’s a farmyard’s worth of turkeys from bedroom devs. And those devs are battling it out with the world-beaters when it comes to ASO (app store optimisation) – the first rule of which is to take the Ronseal approach and name your app after what it does. So, when you search for “notes” in the Google Play store, you have to scroll past 33 similarly-named apps before you get to the brilliant market-leader, Evernote. That’s a pretty lousy user experience, and it’s why people tend to use other methods to discover apps. They read about them in blogs like Gizmodo, they seek recommendations in communities like Reddit, they ask their friends what apps they use and download accordingly. Each of these discovery routes depends upon context-relevant recommendations from trusted sources, which is why developers have tried to bake recommendation into their products by including social media triggers and sharing tools. There’s no question that, if you can get people to tell their friends about your app, sales would rocket. But, think about it: when did you last share an app on Facebook just because? Or even because it was on sale at a bargain price? Exactly: never. It’s just not the kind of thing people do. 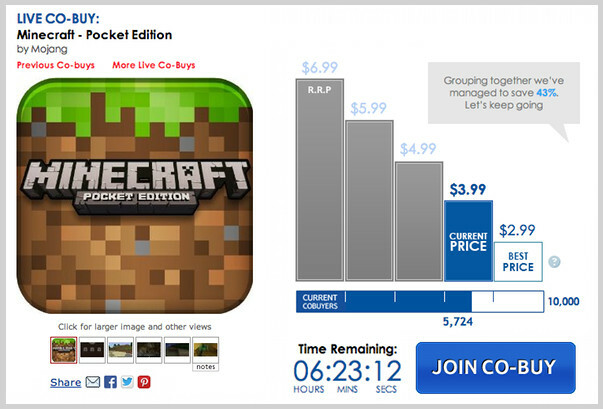 Four great apps, but notice the extra details we’ve included in our mock-up: current price, best price and time remaining. Imagine if Amazon made it so that, the more people who came together to buy an app within a limited period of time, the better the price would get for everyone participating. Finally, you’re giving customers a viable incentive to share because there’s a real and tangible reward there – if you can get your family, your friends, your colleagues and neighbours to join the ‘Co-buy’ with you, you’re not only helping them save, you’re saving money yourself. You’ll notice an extra incentive, that ticking clock – and this one plays right to a core part of human psychology. The behavioural theory of loss aversion suggests that people’s fear of missing out on something may be twice as powerful a motivator as any hope for gain. So, by ring-fencing the Co-buy within a limited period of time, you’re giving people yet another powerful incentive to get on board and share as quickly as possible. It doesn’t end there: you’ll also notice that there’s only 10,000 units of the app available for sale here and 5,724 of them have already been sold. Once again, that’s a direct play to customers’ emotions. Scarcity and impatience are core elements of the gamification expert Yu-Kai Chou’s excellent framework and it’s not hard to see why. When something’s in short supply, we want it more. When something might be taken away at any moment, we determine to make it ours. When something’s hidden on the horizon, we strain to catch a glimpse. These are the principles that underpin everything from movie trailers to limited edition sneakers, and they’re principles which absolutely apply to retail. 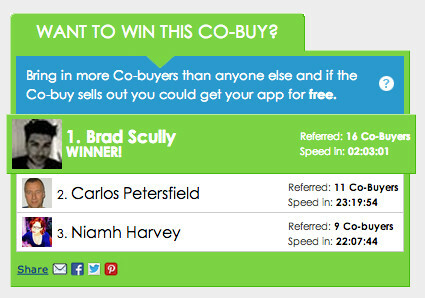 And here’s another way in which we think gamification can incentivise sharing for apps: friendly competition. In this scenario, we’re visibly displaying just how many other Co-buyers everyone’s brought in, right there on the page. Of course, everyone who shares is benefitting because of that constantly dropping price, which gets better and better as more and more people join. But, as you can see, one top sharer is getting a bonus reward: their app for free. Not only does this provide yet another incentive to tell your friends and act as an advocate for the app in question (turning shoppers into marketers and generating the kind of super-effective peer-to-peer advertising you literally cannot buy), it’s also adding an element of fun and society to online shopping, traditionally a rather solitary, flat experience. You’re not just selling a product here, you’re building a community – and that’s how you get people sharing. And things can get even more interesting when you use this kind of Social Commerce to engage external communities. Let’s take the second app pictured above as an example, MotoGP Live Experience 2013 – an amazing product which offers motorcycle racing fans live commentary, timing and 3D tracking of every practice, qualifying session and race throughout the season. As apps go, it’s expensive – for sure – but it actually offers incredible value for the real passionistas, augmenting their experience and putting them right at the heart of the action. With that in mind, Amazon might sell a few hundred copies of the app to MotoGP die-hards, but the sharing incentives built into Co-buying can leverage those core fans and key influencers to engage not only their peers but also the casual fans they interact with on social networks, in online forums and in real-world communities of interest. It might even help access non-fans – people who would never browse to and purchase a MotoGP app; but, once they hear their friends and people they look up to talking so passionately about the sport and the product, they might decide to give it a try. Absolutely, you may end up selling each app for $13.99 instead of $21.20 – pricing definitely plays a part in any Co-buy’s viral effect – but these are incremental sales which Amazon and the developer could never dream of obtaining with a business-as-usual strategy. These are new customers, acquired with zero marketing costs and zero overheads. It’s pure profit, and it’s a great way to turn a boutique product into a mainstream champion. The opportunity for selling apps in this way is enormous and, once you start thinking about the other benefits true Social Commerce can bring to this sector, you begin to see its massive potential. When people are interacting with products as a community, when commerce becomes inherently social, you can do so much more than present your audience with fait accompli promotions. You can get them to request Co-buys for their favourite apps and share those requests with their friends, to build up a groundswell of interest and advocacy even before you put anything on sale. When influential customers request dream apps that don’t yet exist, you can share (even chargeably) this crowd-sourced R&D with partner developers, creating an ideas lab that directly benefits the industry and helps deliver amazing products. 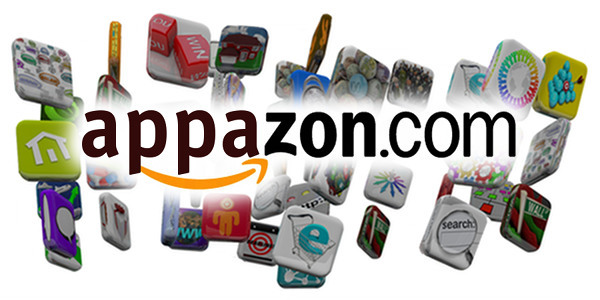 You can even access the app developers’ own social communities and stage special Co-buys just for them, making – in this scenario – the Amazon App Store for Android the place to shop for true devotees. And consider this: by marrying the influence profiles of customers to their existing Amazon order histories, Amazon can start to build a social map of its customer base that’s incredibly powerful, helping them identify and activate influencers in every sector, for every kind of product – even, in Amazon’s case, physical ones. Amazon already has a phenomenal customer base – the biggest in the world. And Amazon’s customer insights are already second to none. But, by activating and engaging this customer base with Social Commerce and super-charging these insights with a social dimension, they can push their App Store into areas the likes of Google and Apple can only dream of.